This is just short post since the meat is in an ipython notebook. I discuss the scan function in Theano, used for looping, iteration over tensors and recurrences. If you are a complete beginner to theano, check out my previous post. It seemed a bit obscure when I first started trying to understand it, so I thought I would share my learning process and hopefully speed up yours! My sources for learning were these two great resources: this and that. OK check it out here and let me know what you think. Today we will be discussing a machine learning algorithm that is probably the most mathematically sophisticated of all the algorithms we have looked at so far. Don’t let that daunt you though! Not all the details are essential for understanding the general idea, and it can certainly be used without understanding the maths, although if you are content with this then there’s not much point reading a blog like this! This post is based on what I have learned from reading the relevant chapter in the excellent book: Elements of Statistical Learning. The premise is exactly the same as the perceptron algorithm, we have input data with class labels . It is handy to assume that is a unit vector, and geometrically it is the normal vector to the hyperplane. I will refer to as the bias. If the bias is zero, then is just a regular plane, and if it is nonzero is parallel to this plane, the bias controls how far ‘above’ or ‘below’ the origin is. In fact if , then . Moreover, is the signed distance of from . Note that if was not assumed to be a unit vector, it would instead be proportional to the signed distance. If we say that is above , and if we say that is below . To classify a point , we say it has label if above , and if below. If this is possible, then the perceptron algorithm will converge to a hyperplane that correctly classifies all of the points. One problem is that there are infinitely many such hyperplanes, intuitively we would like to choose one to maximize the distances of all the points from it. If there are points close to the decision boundary, then it is likely that unseen points from the same distribution might up on the wrong side of the hyperplane and be misclassified. The minimum distance of all the points to is called the margin of the decision boundary, so we would like to maximise the margin. Another problem is that the data might be too mixed up for there to be a seperating hyperplane, no matter which one you choose some points get misclassified. What we need is a way of choosing the hyperplane that does the best job of trying to seperate the points. Finally it may be that a hyperplane is a bad approximation to the true decision boundary, we need something wiggilier. Let’s solve these problems in turn. The first step in solving a machine learning problem is to figure out how to phrase it as an optimization problem, so let’s try that. subject to for , and . Note that implies that is correctly classified since their signs must be the same for the product to be positive. Now that we have the optimization problem setup, we use the Karush-Kuhn-Tucker conditions, normally when trying to minimize a function you look for places where the derivative is zero, and this the extension of that idea when you have constraints. The last condition shows that only for those such that , these are the that are ‘on the margin’, those input vectors closest to the optimal hyperplane. This means that is determined only by these on the margin, we call these the support vectors. The optimization problem can be solved using quadratic programming techniques, it is also sometimes useful to look at the equations given by the KKT conditions and convert it into the ‘dual’ optimization problem in terms of the . Life isn’t always easy, and sometimes the data is not linearly seperable. It is desirable that our algorithm be able to tolerate some errors and try to minimize them, otherwise, even if the data are linearly seperable, the algorithm may fall over itself trying to fit a few bad apples in the data, rather than going for a more natural fit that will hopefully generalize better. where is a cost parameter that we need to choose, controlling our tolerance for mistakes. Instead of trying to minimize an objective function subject to several complex constraints, it is often easier to collect the constraints into the Lagrangian and minimize that, subject to simpler constraints, this is called the penalty method. and minimizing our objective function is equivalent to minimizing with respect to whilst at the same time maxmizing with respect to . This is why this is called a saddle-point method. The constraints for this equivalent problem are and , the others are taken care of automagically. is equivalent to constraining . A much simpler formulation! In fact this is a convex quadratic programming problem, so it can be solved using out of the box methods from a library. We’ve now seen how to cope with errors by using a cost parameter , this is a form of regularization that can control overfitting. But what if the true decision boundary is geninuely something a bit more complex than a hyperplane? The solution to this problem is to change coordinates from using some mapping , then fit a hyperplane in this new space, then the pullback can be a nonlinear surface in . then there is no need to work directly in the transformed space at all! In fact you don’t even need to know what is, as long as you have . This is a big deal because this can be much more computationally efficient if you want to transform to a very high dimensional space. This is what is called the kernel trick, because we get to have the benefits of a richer feature space on the cheap. So in order to do this, you just have to dream up a kernel , to make sure that your actually defines an inner product in some (Hilbert) space, by Mercer’s Theorem what you need to check is that, for any choice of vectors , the matrix is positive semi-definite. I have decided not to do a python implementation this time, because I would have to get in to quadratic programming to do it properly, perhaps I will write a post on this topic in the future. Recently I have finally upgraded my ancient laptop. Other than the ability for me to play the occasional video game, this means that I now have a dedicated Nvidia graphics card, in particular one that supports something called CUDA. Now that I have the hardware, I thought that it would be fun to check out this python library theano. As I understand it, it has two very interesting aspects. One is that it does symbolic computation, that is it represents variables as in mathematics, and their manipulations. A variable in computer science is something like a integer or a string or a list etc…, a piece of information stored somewhere in memory with a name made up by the programmer, and the compiler takes care of associating the human understandable name to the address of the information in memory. A variable in mathematics is like in , an indeterminate quantity that can be manipulated using arithmetic operations, or using calculus and so on. So what in mathematics we call a variable corresponds roughly to a function in computer science. The difference between symbolic computation and its variables, and regular functions, is that the programming language is aware of the mathematical nature of a variable, such that when you apply operations to variables to create new variables, it does this in an efficient way. The best way to understand this is a simple example. Let’s suppose we have two functions . Now we can combine these functions by adding them to make a new function . Now in python say, when you call with an argument, it will pass this argument to both and and then add the result and return it. If we are doing symbolic computation, and were variables with , then the variable constantly. And so the computer does no work at all when using , because it knows that it must always be zero. So one important aspect is that symbolic computation can simplify and hence often optimize functions automatically. Another is that theano can automagically differentiate variables with respect to variables! This might not sound like a big deal, but it is. In machine learning, we often create a complicated function, like in logistic regression or neural networks, and then derive a helpful form for the derivative to do gradient descent to optimize it. In theano, all you have to do is specify the objective function, and it will let you do gradient descent automatically. The second amazing thing about theano is that it compiles its theano functions into C, and so it often runs much much faster than native python or numpy. It can also make it easier to run computations on a gpu which can mean a 100x speedup for the right cases! Hopefully I’ve made you curious, so click here for an installation guide. On this linux machine it was very simple. I am dual booting windows 8.1 and Ubuntu at the moment, it is very tricky to get the gpu aspect to work on windows, but here is a guide for the brave. To check that the GPU aspect is working, run the test code here. I recommend that you read the tutorials here, and also this excellent ipython worksheet here. Let’s little play with the basic functionality. #to communicate to us about the variable. #We can also have vectors. #We can also make new variables using standard mathematical operations. #We can also make python functions which return new variables. #We can of course do standard linear algebra operations also. #comprising it, we make a theano function. #The syntax is a list of input variables, and then a list of output variables. #compiles the function into C, but thereafter it will run extremely fast. #Let's try using the function. #Now we can try computing gradients. #First let's make a scalar variable by taking an inner product. #Now we take the gradient with respect to w.
#in additon to creating a thenano function. #being called in a function. #You can also set a shared variable's value. #of two tuples of the form: (variable_to_be_updated, updated_variable). If you want to tinker with this, get the sourcecode here. I don’t want to go into too much detail here, but an autoencoder is a feedforward neural network with a single hidden layer with the twist being that its target output is exactly the same as its input. If the number of hidden neurons is less than the number of input/output neurons, then the network will be forced to learn some sort of compression. Even when the number of hidden neurons is large, there are various tricks in cost functions you can use to ensure that the network does something more interesting than learning the identity function. The hope of an autoencoder is that it learns some structure in the data, so that the hidden layer can be thought of as a feature space that one can use for a supervised learning algorithm. Basically then we have the hidden layer, then , where are bias vectors, are matrices, and are element-wise non-linearities like the logistic function. A simplification that is often made is to enforce . This gives the model less free parameters to learn, and so is a form of regularization. It also uses less memory. This is referred to as an autoencoder with tied weights. Thanks to automatic differentiation, backprogation is effortless with theano, and thanks to gpu computation, much faster also! I recommend having a look at my python implementation of backpropagation just so you can see the effort saved. This implementation benefited greatly from this tutorial. #and columns correspond to features. #Hidden_size is the number of neurons in the hidden layer, an int. #Return gradient with respect to W, b1, b2. #Create a list of 2 tuples for updates. #Train given a mini-batch of the data. And that is it! Now we should test this puppy out, so let’s find some data. The MNIST data is famous in machine learning circles, it consists of single handwritten digits. Nearly every paper written on neural networks and so on tests their contribution on the data. The task is to classify the digits, but we will just test our autoencoder. First we will steal a very nice helper function to load the data set, this will download it for you if you don’t have it already. You can find it here. # Check if dataset is in the data directory. #target to the example with the same index in the input. We also want a plotting function to visualize the features learned, I won’t explain this here, but if you google “visualizing features of neural network” you can learn plenty about it. Now we put it together. Nothing too interesting yet, in order to get more useful features we could change the cost function to encourage sparsity, or introduce noise into the inputs, or use a different activation function. Hopefully this has been helpful for those just starting out with theano. Here is the source code. Last time we introduced the binary search tree (BST) and saw that they could do inserts and deletions in time where is the height of the tree. We also saw that it could find the successor or predecessor to a node in the same time, and hence that it could sort a list in time, where is the length of the list. Ideally we would have , and this is often the case ‘on average’, but the worst case is , which will occur if we start with a sorted list! So today we are going to discuss how to have our tree try to balance itself automagically so as to keep its height . Recall that the defining characteristic of a BST is the so-called ‘search property’: for any subtree rooted at a node, the stuff on the left is smaller, and the stuff on the right is greater. 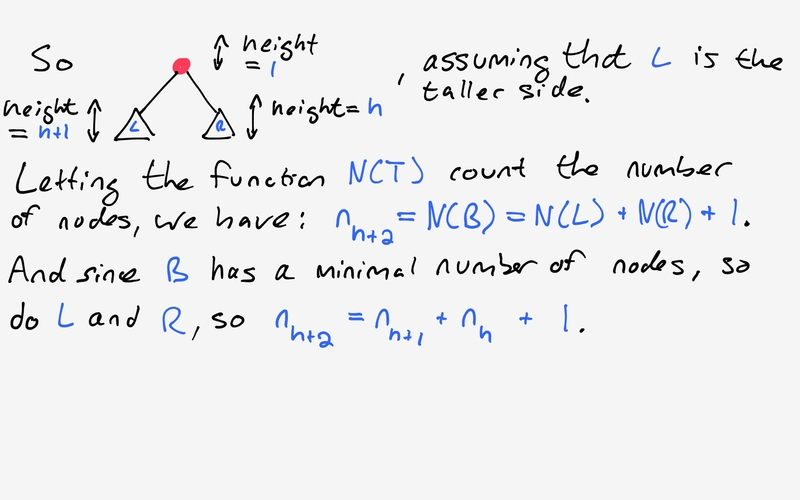 We now introduce another property or invariant that we will insist upon and call it the ‘plus or minus property’ (pm) or ‘balance property’, and it is satisfied by a node if the height of its left subtree differs from the height of its right subtree by no more than one. We call a BST that satisfies pm an ‘AVL tree’ (AVL). So we will give each node an extra field node.height, and node.balance, where node.balance is equal to the height on the left minus the height on the right. Hence it will be 0 when they are equal, +1 when the left is larger, and -1 when the right is larger. Before we go any further, you might be wondering whether or not this property forces the tree to have height, and indeed it does, so let’s prove that to ourselves before coercing our trees to have this property. Define to be the smallest number of nodes you can build a AVL of height with. That is, any AVL of height must have at least nodes. Now suppose that we had shown that , or in particular that for all . 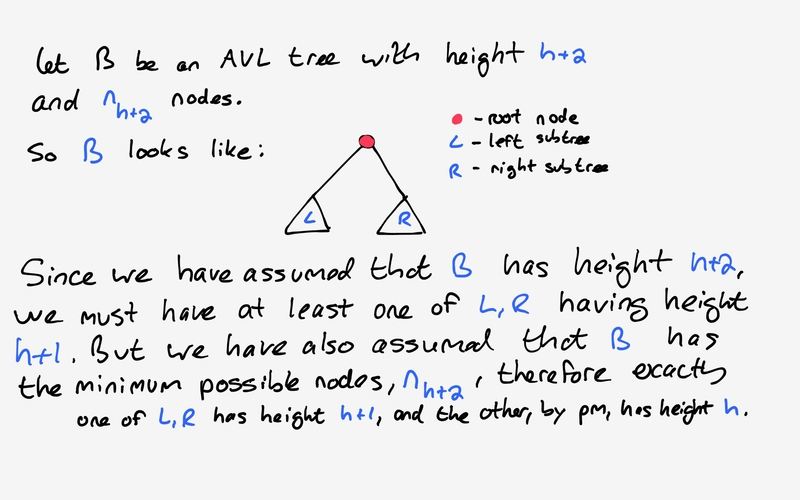 Now take any AVL tree of height and having nodes. Then as desired. So we just need to show that . The way to do this is by setting up a recurrence relation. Indeed we will see that . Now that we agree that the AVL or pm property is a thing worth having, we should alter our code for a BST so that the nodes have height and balance fields, and so that the insertion and deletion methods update this accordingly. Once we have done that we will look at how to enforce the balance property. Now we could use class inheritance and modify the BST class we built last time, but some of the code is a bit kludgy and so I will implement this from scratch, although I won’t go into detail about the stuff that is the same from last time. We begin with the AVLNode and gift it with a sense of balance. #if not we just correct the given node. #so change it before checking to see if height needs updating. #We only need to go up a level if the height changes. #Handy to find out whether a node is a left or right child or neither. I think the code, and comments, should explain everything if you read my last post. Let’s also pretend that we had a magic function balance(node), which will balance a node and then move up ancestors and do the same, we won’t worry about what exactly it will do, but add it into our insert routine. #The first call is slightly different. #First call, start node at root. #No need to insert, key already present. #Reached the bottom, insert node and update heights. #Now we handle nonfirst calls. #If key not in tree, we return a node that would be its parent. #Empty tree or key not in tree. #No need to update heights or rebalance. #Deleting a lone root, set tree to empty. #Key is largest in tree. #I also include a new plotting routine to show the balances or keys of the node. #Builds a copy of the BST in igraphs for plotting. #left and right children, we build it using a queue. node=queue #Select front of queue. G.vs[index+1]['color']='red' #Left children are red. If you want to make sure it works, I have written a small test function. Great now we know the balance of each node, but how to balance the tree? 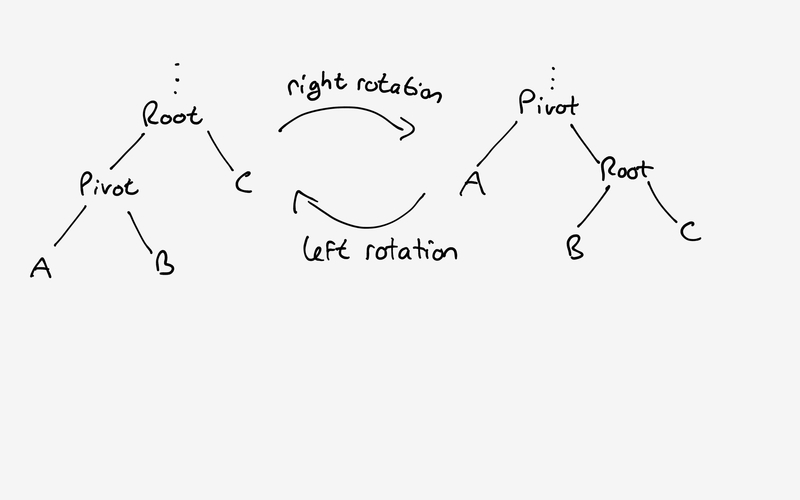 So there are two moves that are inverses of one another, a right rotation and a left rotation. Staring at the diagram for a little bit you can also see that these moves preserve the search property. Let’s implement this, and then consider when to use it. We’ll first create a right rotation, then swap the lefts for rights and vice versa to make a left rotation. 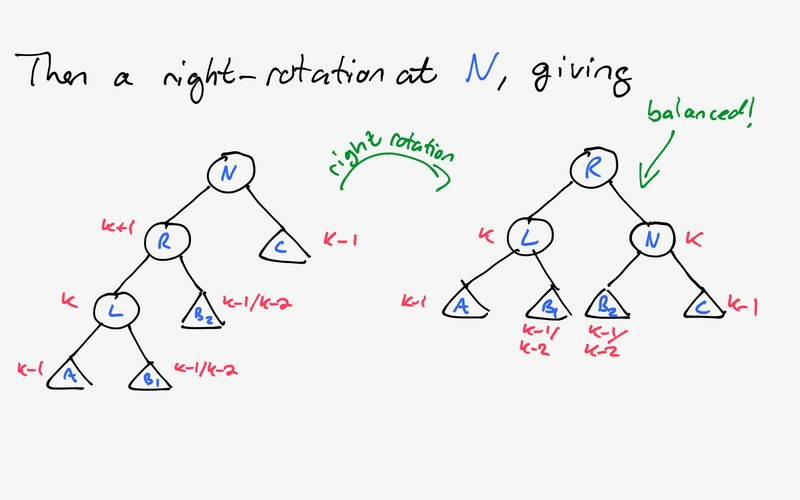 The argument to the function will always be the root, that is the parent of the two nodes, so in our diagram above, the label root is appropriate for the right-rotation. We then move around the the parent-child pointers. 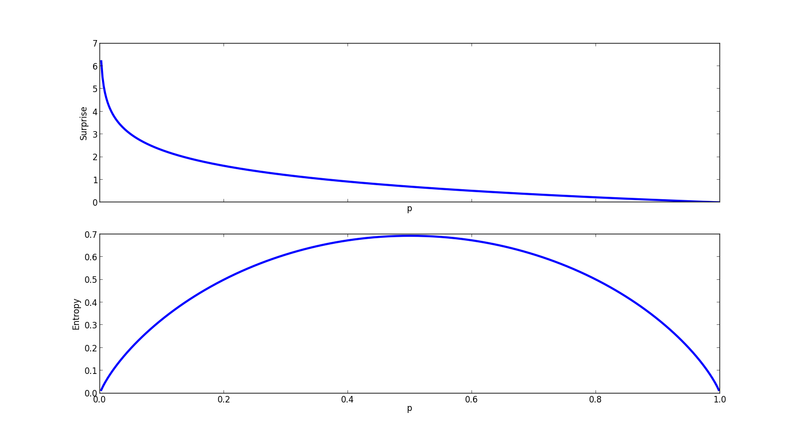 Notice that the relation between the root and , and the relation between pivot and , is unchanged. The changes we have to make are that changes parents, and that root and pivot swap places from parent/child to child/parent. So the left-child of root, pivot, is changed to the right-child of pivot, , the right-child of pivot is changed to root, the parent of root is changed to pivot and finally the previous parent of root, if any, becomes the new parent of pivot. 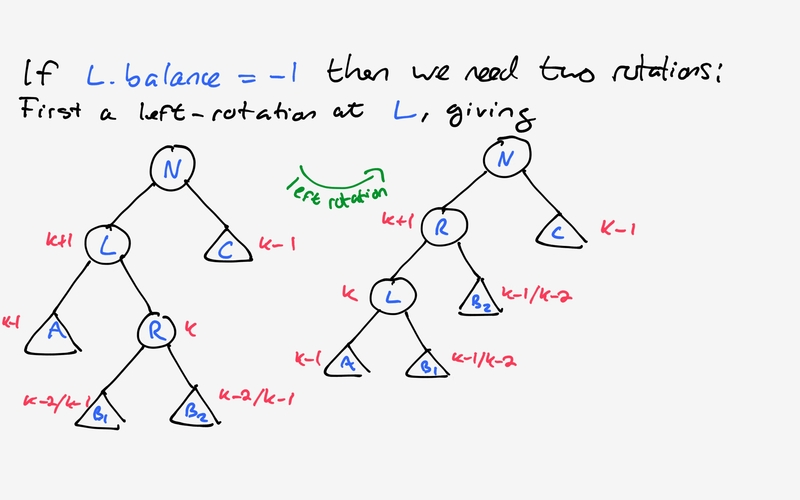 Finally we show how to use tree rotations to keep a AVL tree balanced after insertions and deletions. After an insertion or deletion, heights can change by at most 1. 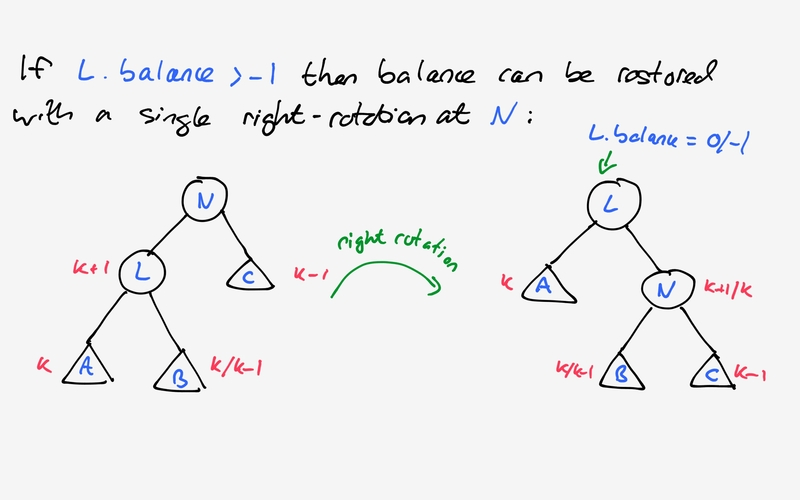 So assuming that the tree was balanced prior to the operation, if a node becomes unbalanced, it will have a balance of . Let’s look at the case where we have a node with balance with some pictures, the other case is the same modulo lefts and rights. To implement this is simple now that we have the right tools. We want to function to start with the changed node, either the inserted node in insertion, or the parent of the deleted node in deletion, and move up through the ancestors, updating heights and balancing as it goes. We might as well make a sorting routine to wrap the AVL Tree now. And that’s it! Please let me know if you spot any mistakes. You can download the source here. So in preparation for starting a PhD in Machine Learning/Data Science at the University of Edinburgh . I have been watching some of the lectures on algorithms and data structures at MIT here. One of the data structures discussed is the binary search tree (BST), and so in this post I will explain what they are and give a python implementation. As you might expect, a BST is a way of organizing data in a binary tree. It consists of a collection of nodes, each of which has a key, corresponding to a piece of data, say an integer. Importantly the keys must be comparable, so that for any two nodes either or . Each node also has (at most) three pointers: parent, left child and right child. Most importantly we have the invariant of the BST. An invariant is, of course, something that stays the same, a property that is not altered under any of the data structures allowable operations. 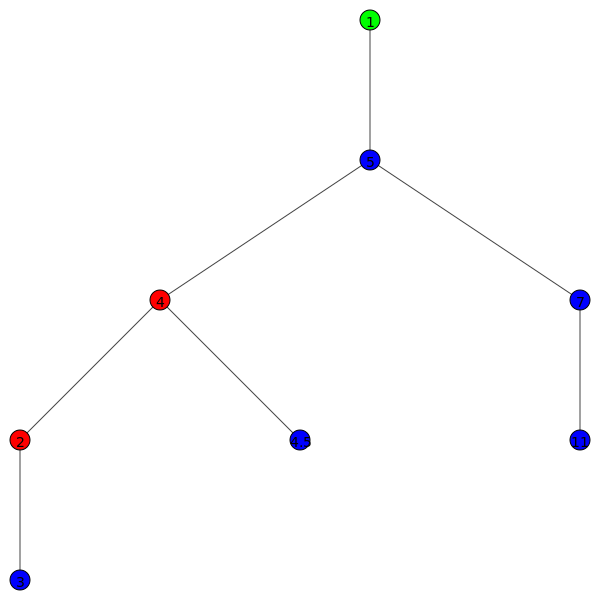 The invariant or search property is that for any given node all of the nodes in the left subtree rooted at have keys less than , and all of the nodes in the right subtree have keys greater than . Now I think you get the idea, so let’s start coding this up. First we will make the BST node. #and possibly 'pointers' to a parent, left child or right child. Next we will start making the BST. The BST remembers the root, and the pointers do the rest of the work. We begin by implementing a helpful method called ‘find’, which returns a node with a given key, or that could (but doesn’t) have a child with that key. #Returns a node corresponding to a key. #If key is the key of some node, returns that node. #If tree is empty, returns None. #a node with that key as a child. #This function wraps a call to a recursive function self._find. Using ‘find’ we can then implement ‘insert’. #Inserts a node with given key. #If key already in tree, then returns the node with that key. #Otherwise creates a new node and returns it. #This takes time of order the height of the tree. The next thing we want to do is be able to delete keys. If a key belongs to a leaf node then this is simple we just delete the node. If the node has one child, then if it has a parent then when we delete the node we must connect the parent to the child of the deleted node. So we swap the node’s key for this new rightmode node’s, then delete the rightmost node. Since it is rightmost it cannot have a right child, and so it is one of our base cases for the deletion operation. If this is still not clear to you, do some examples on paper and you will soon see the idea. Let’s implement this. #If key is not in BST does nothing. #Otherwise it calls a semi-recursive function _delete. #directly by removing it and then gluing the tree back together. #replace the deleted node, and deletes the lower down node. Ok great, we have now covered the basics of how to modify a BST. Now we want to know how to extract information from it. In particular given a key, we want to be able to find the next largest or smallest key in the BST, if any. Calling the successor (predecessor) operation repeatedly, starting from the left(right)-most node, will give us the sorted keys in ascending(descending) order. I will explain how to find the successor, the predecessor case is of course very similar. Let’s suppose we want to find the successor of node with right-child . In this case we choose the left-most child of which we will call . 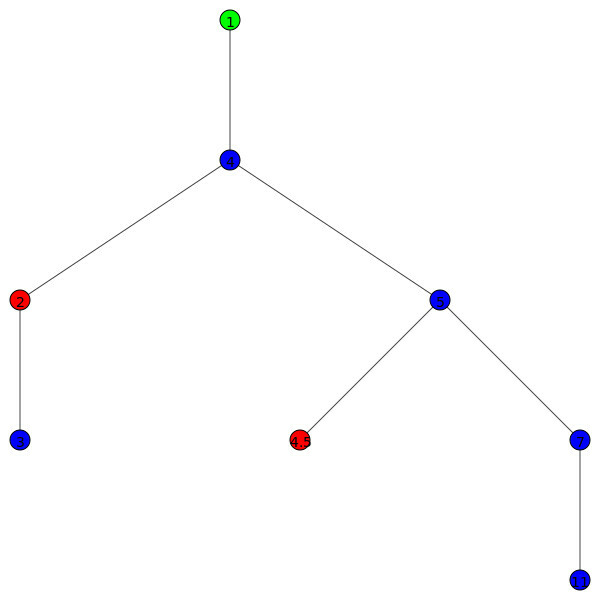 Note that in a subtree rooted at some node, the left-most node is the smallest element in the subtree, and the right-most node is the largest. So in the subtree rooted at , the right-subtree rooted at contains all the elements in the subtree greater than . The left-most element of the right-subtree is then the smallest element in the subtree greater than and is a good candidate for a successor. Let’s draw a picture and try to see why this must in fact be the correct node. OK, but what if has no right child? In this case we move up through the ancestors of , searching for the first ancestor that is a left-child of its parent. If there is no such node, ie we get to the root, then is the right-most, and hence largest, element in the tree, and has no successor. To see that this is correct employ a similar argument to the previous case. #Key is smallest in tree. By now I think we deserve to see the fruits of our hard work, so let’s whip up a plotting routine using igraphs. 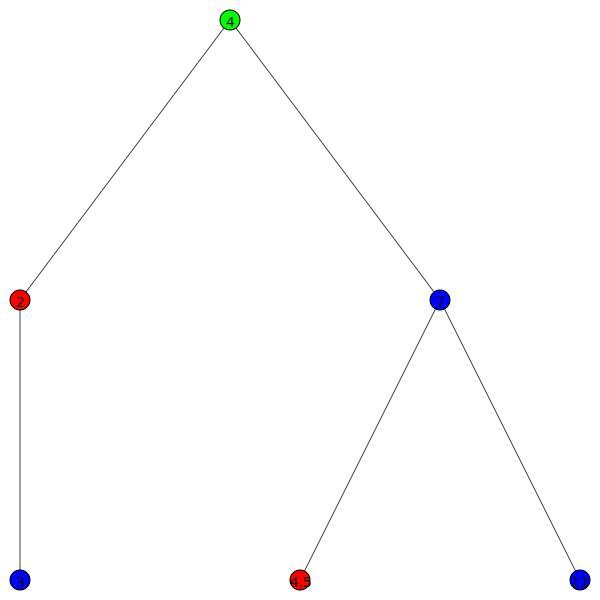 Don’t worry about the details: since I can’t find a binary tree plotting style in igraphs, I have colored the root green, left children red and right children blue. In order to preserve information about left and right children, the plotting routine builds the graph in igraphs using a queue. None” to the console, as desired. You can probably see that the operations take time where is the height of the tree. This means that we can sort a length list in time. On average , but if given a monotonic list we will get a linear tree with . So next time we will see how to ‘balance’ the tree using tree rotations to achieve fast operations. Please feel free to leave any comments, suggestions or corrections! Here is the source code. Let’s suppose we have a system with states which happen with probabilities . On the other hand we have our model for the system which encode our beliefs or predictions about the states’ probabilities . First the surprise should be a function that takes a probability to a real number representing the surprise. Secondly if , then we will be infinitely surprised, so in this case. Similarly if , then we won’t be surprised at all, so . We would also like to be a nice function to work with, so let’s have it be continuously differentiable. One final property is that I would like surprise to be additive or extensive , this means that for independent events , I would like to be . This is the main difference between probability and surprise, surprises add up, whereas probabilities multiply. I think it easier to think about adding so this makes me happy. So in general we want . If surprise doesn’t seem to be additive to you, most likely because you have been reared on probabilities, you can substitute ‘surprise’ for ‘information’. If you play around with these constraints you will find you need to be a negative logarithm, that is . If we choose a our base, as mathematicians prefer, we measure it in nats, if we work base 2, as computer scientists like, we have bits. This is also referred to as the self-information. the expected surprise. This is only defined when , and whenever , by convention we let . If this offends you then you should alter the definition to take the sum over the support of ! and refer to it as the cross entropy. In the special case where , where the model matches the true probabilities, we call the entropy of and write or for this quantity. Using Jensen’s inequality, we can show that the entropy is maximised iff for each outcome, in which case . As you can see, you can make the first outcome very surprising or informative, but you pay for that by making the complementary outcome less surprising, the lower graph shows that the optimum compromise comes from having both outcomes be equally likely. Intuitively any approximate model will increase the surprise so that . The difference is then a measure of much more surprised we are when using the model, this quantity is written and called the Kullback-Leibler divergence, which is a kind of oriented distance between distributions, notice that it is not symmetric and so not a metric. Our intuition that can then rewritten as , and in this form it is known as Gibbs’ inequality. Also notice that if so the inequality is sharp, and moreover, since we are dealing with a strictly convex function the divergence is zero if and only if . Now for two random variables we can consider the entropy of , conditioned upon . We can call this , now as ever we take the expectation to give the conditional entropy of given . where is the joint entropy. which we call the mutual information of and . to prove this is not hard and so I won’t bother. Notice that Gibb’s inequality then implies what we guessed before, that conditioning does not lose information (or increase surprise). What is the interpretation? Well if and only if and are independent. So we are measuring the how much more surprised we will be if we assume that are independent, alternatively, how much information is lost by modelling as being independent, so it is a measure of dependence. Fascinating! It is interesting to compare this with the correlation of and . This is also a measure of dependence, recording the extent to which large values of correspond to large values of for positive correlation, or large values of correspond to small (negative) values of . It is possible to be uncorrelated but be dependent. By contrast mutual information is totally oblivious to large and small values, it cares only about the probabilities and so in my opinion is much more beautiful. What’s more, by Gibb’s inequality, the mutual information is zero if and only if are independent! So it is a purely informational measure of dependency, in that it fails to encode anything about how the dependency is seen from the perspective of the metric. So it really depends on the context which is more useful. For making estimates of random variables, the values are important, and so the correlation or covariance will likely be more useful. To illustrate the usefulness of entropy we will play a game. I will pick a number uniformly at random from the unit interval . You can then make a guess , and I will tell you whether or . After I tell you, you have narrowed down the location of the number to if or if . Note that and so , and . Therefore any extrema are minima, and since is the unique solution to , we know that guessing minimizes the expected length of the interval. Now if is the score I give your guess, a random variable taking values so that , then we have already seen that to maximize the entropy of we should have each outcome be equally likely and so take . So the idea is when performing an experiment, or asking a question, the better you are able to predict the answer, the less you learn, and vice versa. So we see that maximizing our entropy is the best strategy as we’ve proved using calculus. What about if we are allowed to make guesses ? If we choose to maximize our entropy with each guess, guessing halfway along each interval, then we will have narrowed down to an interval of width , but is this still the best strategy? Intuitively it does still seem like the best plan, but it isn’t quite as obvious as in the case of 1 guess. Any deterministic strategy (that doesn’t repeat guesses!) can be described as narrowing down to intervals of lengths summing to , and the probability of the strategy ending with an interval of length is . The expected length of an interval is then . This suggests a geometric interpretation, what we are looking for is the point on the standard simplex closest to the origin. Now if you read about projecting onto the standard simplex, you will see that we can immediately conclude that we should take . 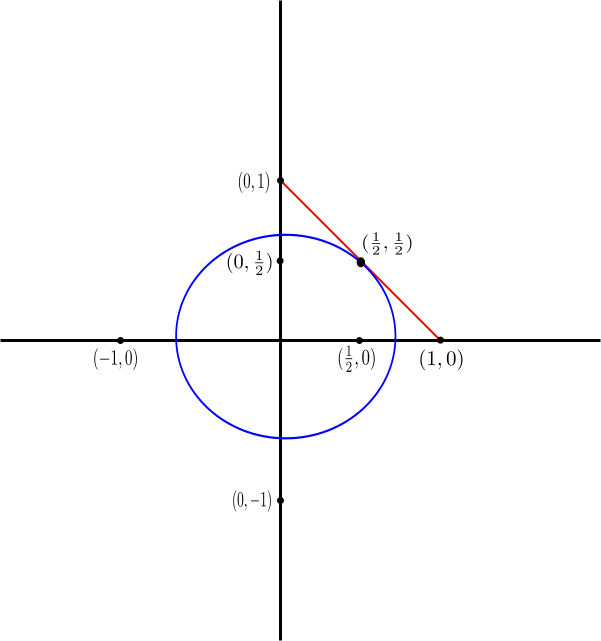 the sphere in this case is just a circle, shown in blue. The constraint set is shown in red, the set of points with nonnegative coordinates summing to one. You can see that if you start with a small circle and expand until it hits the red line segment, the circle will hit it at the point . So we are minimizing a function, the radius, subject to a constraint that the function be tangent to the set of points satisfying . This is precisely the situation encountered in the method of Lagrange multipliers, if you want to understand this idea I recommend checking out this blog post, Lagrangians for the Amnesiac. which is precisely what the geometry tells us – that needs to be tangent to the standard simplex. implying that is the same for each , which forces . So yet again the best policy is to maximize the entropy at each turn! I invite you to think about stochastic strategies. In the future we might look at how entropy is related to compression, or how the KL-divergence can be used to induce sparsity in an autoencoder. Ok so last time we introduced the feedforward neural network. We discussed how input gets fed forward to become output, and the backpropagation algorithm for learning the weights of the edges. Today we will begin by showing how the model can be expressed using matrix notation, under the assumption that the neural network is fully connected, that is each neuron is connected to all the neurons in the next layer. Once this is done we will give a Python implementation and test it out. Most of this I learned from here. In what follows, vectors are always thought of as columns, and so the transpose a row. So first off we have , our input vector, and our output vector. Our neural network will have layers with the input layer, and the output layer. write for the real matrix containing the weights of the edges going from (not including bias neurons), so that . And we call this output . Now write for the error at the layer defined . Then , and , where the multiplication is component wise. Write for the matrix with entries , for non-bias weights. Then we have , the outer product of and . And for the biases write for the vector with component . We will create a class NeuralNetwork and perform our calculations using matrices in numpy. #Counts number of neurons without bias neurons in each layer. #Activation functions for each layer. #Derivatives of activation functions for each layer. #List of weight matrices taking the output of one layer to the input of the next. #Bias vector for each layer. #Input vector for each layer. #Output vector for each layer. #Vector of errors at each layer. #We initialise the weights randomly, and fill the other vectors with 1s. #There are only n-1 weight matrices, so we do the last case separately. #Propagates the input from the input layer to the output layer. #Update the weight matrices for each layer based on a single input x and target y. #repeats this process n_iter times. #We shuffle the order in which we go through the inputs on each iter. And we’re done! Now to test it we generate some synthetic data and supply the network with some activation functions. 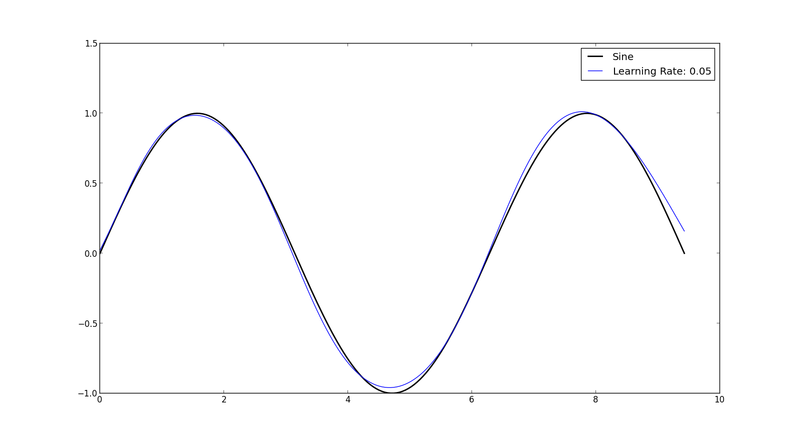 First we will try to get it to approximate a sine curve. #expit is a fast way to compute logistic using precomputed exp. Next we will try a classification problem with a nonlinear decision boundary, how about being above and below the sine curve? 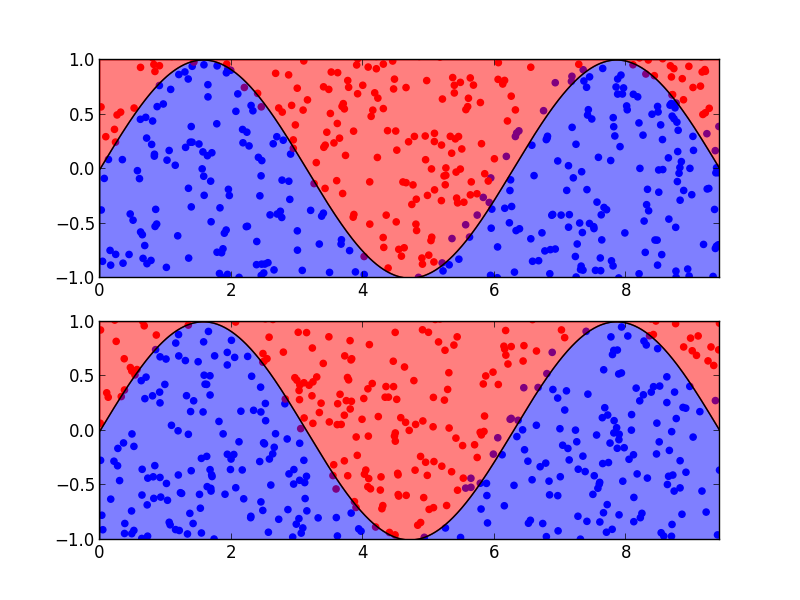 #We plot the predictions of the neural net blue for class 0, red for 1. #Shade the areas according to how to they should be classified. When I ran this it looked like this. The top plot shows the performance on the training data, and the bottom the performance of on the testing data. 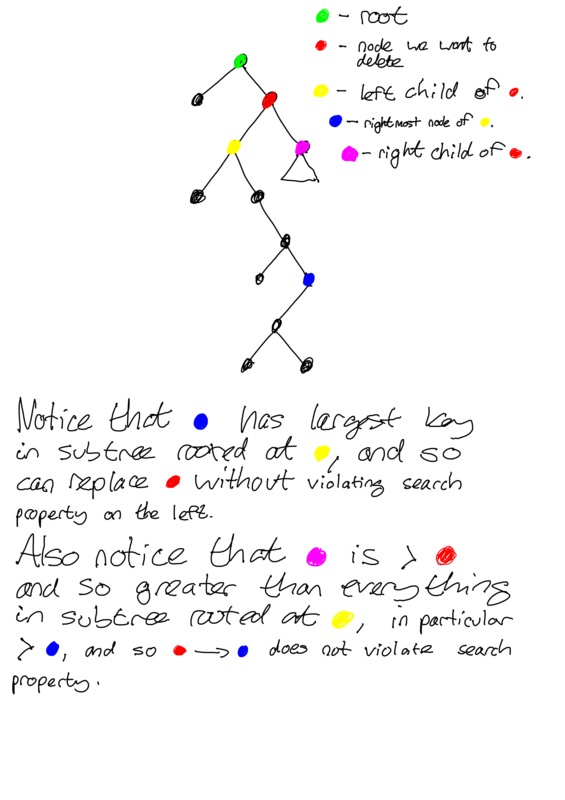 The points are colored according to the net’s predictions, whereas the areas are shaded according to the true classifications. 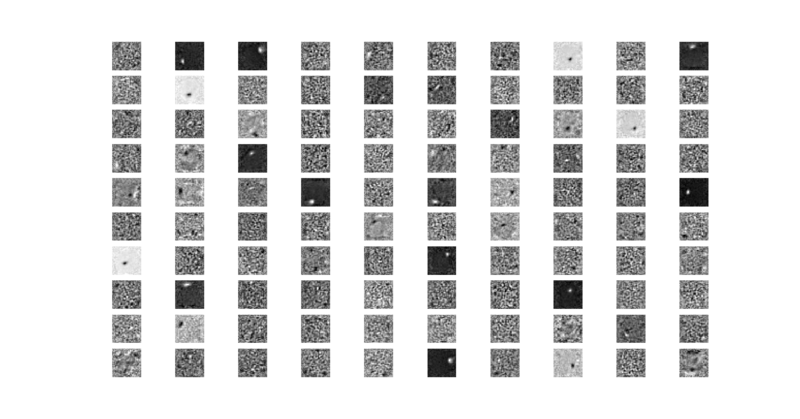 As you can see neural networks are capable of giving very good models, but the number of iterations and hidden nodes may be large. Less iterations are possible using good configurations of the network i terms of sizes and numbers of hidden layers, and choosing the learning rate well, but it is difficult to know how to choose these well. It ended up being quicker to choose a larger number of hidden nodes, a large number of iterations, and a small learning rate, than to experiment finding a good choice. In the future I may write about how to use momentum to speed up training. The code for this post is available here, please comment if anything is unclear or incorrect!